Posted by WorldbyStorm in Culture, Film and Television, Irish Politics. Thought Number Two. Frank Capra. I’ve had a fix of his movies over the last week or so. It’s A Wonderful Life, Mr. Smith Goes to Washington, we’ve all seen them. We know the plots and Jimmy Stewart’s indolent franticness. I like them very much, but politically I was wondering about them. Is the former a paean to small scale social democratic solidarity through the vehicle of the ‘buildings and loans’, or is it a chorus of praise for the nuclear family as the centre of social life. Or…is it both? Mr. Smith Goes to Washington? Courageous fist shaking in the face of the totalitarians (made in 1939 you may recall), or populist appeal to stymie corruption within the Beltway (not that such an entity existed at that time – I presume). Or perhaps it’s just US populism, a strain of political thought we seem to have seen vanish in Europe but which at one time was mighty popular in the US – I refer you to Christopher Lasch for a more recent exponent of same. Thought Number Three…. Dublin. Was it me or did the city seem to actually quieten down the last couple of days before Christmas. I was out the Thursday, Friday and then Christmas Eve and was amazed at how few people were about on the Friday and Christmas Eve. Where did everyone go? I’m also pretty amazed at how relatively many people checked in here over that period. Good on youse. Finally just a small word about Sallie “So do you like politics?” (1912-Christmas 2006), who was more than half right about Gerry Adams “He’s got a lovely smile” and more right than we realised at the time about Charlie Haughey “He’s got a horrible face”…. 🙂 Greatly loved and sorely missed. Posted by WorldbyStorm in Books, Culture, Film and Television, Music, Science Fiction, Television Shows. Following on from franklittles exhaustive and worryingly appropriate buying for lefties post here’s a few of the books, films and music which made my year. The most impressive book I read this year was almost definitely Stephen Howe’s Ireland and Empire, Colonial Legacies in Irish History and Culture (for which cheers smiffy). As a means of positioning one’s own thoughts on the matter it was invaluable (and indeed a great reference point for the Post-Nationalism pieces I’ve been posting over the past few months). Beyond that the revised edition of Unionist Politics by Feargal Cochrane was also mightily interesting. It’s a brilliant means of getting to grips with the Unionist identity and it’s internal dynamics. Auschwitz by Lawrence Rees and Interesting Times by Eric Hobsbawm were brilliant if depressing and perfect for dipping into as the mood took. Paul Berman’s Power and the Idealists is a wonderful read, particularly for anyone who feels at home in the left beyond the Labour party. Finally Elusive Peace by Ahron Bregman was a fine overview of the disintegration of the Palestinian/Israeli peace process from the turn of the century onwards. Fiction. Well a mixed bag this, but a couple in particular stand out. I’m currently wading through Terrorist by John Updike. Good so far. Michael Shaara’s novel of the battle of Gettysberg, Killer Angels, although first published in the late 1960s is an excellent anti-war piece (for which cheers Eagle). It’s a period I had little knowledge of before and accepting all the caveats of historical fiction there was something briliiantly lucid about it’s approach. Towards the trashier end of the spectrum, well, Charles Stross’s the Atrocity Archive was a briliant fusion of Cthulu mythos (of which I was unacquainted with in terms of actually reading the stories until this year) and Len Deighton, highly recommended. I also kind of liked John Creed’s Black Cat Black Dog, a thriller set in the North. But then again I didn’t (like, what’s happened to proof reading this century? ), so buyer beware. The various offerings by Alastair Reynolds, Ken Macleod and Peter F. Hamilton, respectively weren’t to my mind as quite as good as previous works but readable nonetheless. Speaking of books, for those of us based in Dublin the new Chapters on Parnell Street has opened and as a more than usually helpful staff member said to me, it’s the largest independent bookshop in Ireland or the UK. They’re moving their second hand section in over the next couple of days and after that the Middle Abbey Street shop closes. It’s well worth a look. Films. Of those I saw only a couple really stood out. United 93 was, as noted previously, remarkable. A Scanner Darkly was – to my mind – one of the most interesting films I’ve ever seen. Looking beyond Rob Lowe and Keeanu Reeves performances and just seeing how it messed around with form and somehow was entirely true to the original work was astounding. Goodnight and Good Luck, while really just on the cusp of 2005/6 remained for me another brilliant snapshot, more suited in many ways to the stage than cinema and yet just perfect as a short and thoughtful consideration of the very real dangers of political rhetoric in democratic societies. Miami Vice was pretty good, but sort of flawed. So, Mr. Mann, no change there then…And, yeah, there’s a stack of films from this year I’ve still to see. Music. Ah, well, by now you’ll know I’m shameless in my retrospectivity and ability to listen to almost anything, although as someone once pointed out to me there’s a difference between eclectic and undiscriminating taste. I signed up with a subscription based MP3 provider early this year and – to be honest – haven’t regretted it once. Granted this provider is one that deals in independent record labels and such like, so of course I’d be happy. Anyhow, what did I like? Well, a couple of new albums have really impressed me. The White Rose Movement, I Love You but I’ve chosen Darkness, Big Spaceship, VNV Nation, Dykehouse, Airiel and currently I’m listening a lot to Motorhead’s latest release. And of the older stuff, I’ve managed to get much of the Fall’s back catalogue, a heap of shoegazing bands from the last ten years, and realised that my iPod just isn’t big enough. Guilty pleasure? Fields of the Nephilim. On media, I know I bang the drum for KCRW, but really, can you afford not to listen to it? Little Atoms has been great, even when the interviewees have not. The Daily Show has been good, if perhaps not quite good enough for daily viewing, I’ve purchased the odd issue of the New Statesman and New Scientist, but Scientific American, Prospect and Analog remain must reads. Blogs? They’re all to the right of the screen, no reason to say more. Finally a small word of thanks to my comrades on this blog mbari, joemomma, franklittle and smiffy, and to those of you who have contributed to discussions and thoughts, and to anyone else who is just passing through and been good enough to pass the time here. And after that? Well, who knows what 2007 will bring – rocket shoes and holidays to Jupiter perhaps. If not, mines a Beamish. Posted by WorldbyStorm in Culture, Ireland. Thanks, FL, but keep posting, anyhow this is the second last post before Christmas! I was at a conference in April which dealt with the changing nature of Irish society and how that impacts on the public space. The issue of language and how that was to be tackled in a multicultural society came up, and there were various ideas thrown about as to how to integrate Polish and such like into state produced material and signage, how the use of two languages (or more) would have cost and other implications and how the necessity for bilingual solutions was a very real worry. So, it’s no real surprise that there was both good and bad news on the Irish language front as reported in the Irish Times during the week. The good news is that the government has revealed a plan to create a ‘bilingual society’ over the next 20 years. The bad news is that it’s unlikely to succeed in the way they intend and I think that that is a pity. * Full implementation of the Official Languages Act and facilitation of the public’s right to use Irish in dealings with the State. * Provision of a wide range of services to parents who wish to raise their children through Irish. * Continuous development of high-quality broadcast services through Irish, especially on TG4, RTÉ and Raidió na Gaeltachta. * Special support for the Gaeltacht as an Irish-speaking area. * Continuation of teaching of Irish as an obligatory subject from primary to Leaving Cert level while fostering oral and written competence. * Enhanced investment in professional development and ongoing support for teachers as well as in provision of textbooks and resources and in support for innovative approaches to teaching and learning. * Further development of all-Irish secondary education. Now this very day I had the opportunity to actually read the plan issued by the Government (and if you like it’s available in pdf format here. And very fine and shiny it is too with enormously large type to conceal the fact that… these appear to be simply a shopping list of objectives. The words ‘continue’ ‘encourage’ and so on are used throughout. As a coherent means of introducing a truly bilingual society they seem entirely inadequate. In part the problem is that there is no clear route to reestablishing a language easily in an advanced capitalist state. Political and public pressure will always mitigate against the more hard edged policies (note the concern over the status of Irish as a compulsory language in Second Level education). And whatever cultural nostalgists say, there never was. I remember a couple of years ago, in the course of some research, I found an internal document from the Department of Finance released in 1932 where funding for Gaelic typeface typewriters was refused on the grounds of cost (circular No. 15/32. Department of Finance, 18 April 1932, 29/12, (National Archives) seeing as you asked). Now, one can make an argument that there were higher societal priorities during that period than the re-introduction of the language, and yet that document seemed to me to say it all. Lash on the rhetoric about the Irish language but make no particular effort to support it by actions. Thankfully we’ve moved into more enlightened times, and it’s one of the truly rewarding aspects of computer technology that – for example – my Apple can utilise Irish language inputs through the keyboard. A small, but significant step forward. And it’s been these small but significant steps which seem to have given Irish a degree of critical mass entirely lacking in former years. I think funding for TG4 etc has been extremely positive. There has, to some degree, been a virtuous cycle whereby Gaeilscoileanna are increasing in popularity which again is no bad thing. And thankfully many of the sour arguments of the 1980s such as ‘what is Irish for?’ have been diluted by increasing prosperity and a recognition that it’s not an either/or situation, that in this society and economy funding is available for both and that a pluralistic approach is both feasible and appropriate. However, being pessimistic I’d tend to think the Gaeltacht areas as specific geographical entities are probably bound to diminish yet further – the crushing disparity in the statistic that 43% of the population are able to speak the language while only 3% use it as their daily means of communication is a sign of the problem. However, this isn’t by any means the end of the language. New social and cultural networks (of which interestingly the web is a significant aspect) can step into the breach. And the plan has one great redeeming feature. It speaks of a bilingual rather than a monolingual society, which while a retreat on one level is entirely pragmatic on another. This is achievable. But lists of objectives, while a necessary first step are not enough. A strategic plan with clear goals and means to implement them would be a better start. Nach bhfuil..? Late addition: go to here and check it out. Doesn’t surprise me, but it puts the above in even more stark perspective. Posted by franklittle in Afghanistan, media, Media and Journalism, The War On Terror, United States, US Media, US Politics. Firstly, I am not, despite two posts in a row, trying to take over from WBS, and secondly, I really do have to stop using question marks in the titles of my posts. A short one this time. The indispensible Mother Jones has a really interesting interview with Rick Scavetta, the former US Army chief of media operations in Afghanistan, who finished up in February 2006. Short, snappy and interesting. “MJ: What are other ways to manipulate public opinion? RS: Since I’ve been home…I get the casualty lists. The thing that’s startling is that they’re masking the casualties, the cost of the war in Afghanistan…..
MJ: What? Masking the casualties? I’ve never heard this before. But here’s the sad fact: 99.99 % of coalition forces in Kunar are in fact American. So now in the news — NBC news, national news, wire services — the only thing that’s released is that a “coalition” soldier was killed in Afghanistan today. Posted by franklittle in Economics, Fine Gael, Irish Election 2007, Irish Labour Party, Irish Politics, Labour Party, Northern Ireland, Sinn Féin, Social Policy. Taken me ages to get around to writing this, first suggested by an article by Shane Coleman in the Sunday Tribune a few weeks ago. In it (free sub required) he provides the only substantial analysis of Sinn Féin’s recently published pre-budget submission I’ve yet to come across, and sparked enough interest in me that I sat down to read through the document. Firstly, Coleman’s case is a simple one. Worth nothing by the way that Coleman is a good journalist. For far too long he laboured in the vineyard while the inexplicably highly regarded Stephen Collins blathered on. He argues that Sinn Féin’s economic policies are deeply flawed, would wreck the economy and ‘seriously risks returning Ireland to the bad old days of the 1980s’. Coleman warns us to be ‘extremely wary of anyone or any party that seeks to change that winning formula’, said formula being a reference to the all powerful and successful Celtic Tiger. The Greens too have been edging towards this ‘consensus’ with Harry McGee pointing out in the foreward to the just published history of the Green Party that it is moving towards the centre on taxation, towards prudence. Labour, as has been pointed out elsewhere, are committed to ensuring that taxes will stay down, an inaccuracy as it happens as taxes have actually gone up with the taxation system becoming more service charge based and therefore regressive. I might pay slightly less PAYE than I did in 1997, but the Little household now has to pay bin charges and various other unpleasant taxes where I am charged for the packaging waste I didn’t want to buy in the first place. Nevertheless, Labour have clearly abandoned redistributative taxation. Sinn Féin has gone a different tack. Firstly, they propose a vastly improved level of social welfare payments, over and above what Cowen delivered,; the introduction of a Cost of Disability Payment; an increase in the minimum wage to E9.30; a massive increase in the pension; improvements in maternity benefit and the introduction of parental leave and so on; medical cards free for under 18s. It’s all good stuff. But they also propose to pay for it. This includes reform of tax loopholes and the like, with a special focus on tax breaks for private hospitals, but also a 50% top rate of income tax for high earners; increase Corporation Tax to 17.5%; doubling Capital Gains Tax back to 40%; the introduction of a tax on second properties, rate unspecified and, the elimination of unjust tax breaks for private pensions. Now, whether all this would work or whether it is all is a good idea is a good topic for a debate. But before we get into that, consider this. Sinn Féin is breaking the consensus on taxation, proposing a taxation system radically reworked and targeted at high earners and the better off, redistributing wealth to people on low incomes. For the most part, their proposals are costed, with expected revenue identified and expected costs. The notion of a ‘consensus’ on taxation must be called into question when the third largest party in Ireland, as Sinn Féin likes to refer to itself, is setting out a counter-argument. And a reasonably thorough counter-argument. Their pre-budget submission is, as far as I know from a quick glance at the sites of the other parties, the most comprehensive economic document published going into the next election. Their desire to be seen as comprehensive can be found in the fact that a 23 page document has managed to accumulate over 50 endnotes. For those of us on the left, there is a lot to like here. The absence of carbon taxation or any real kind of environmental reference at all is a bit glaring, and frankly unforgivable the more I learn about environmental issues, though in fairness to them they find space to deal with asylum seekers and immigrants, unlikely to feature heavily in many other party’s proposals. It would be going a little too far to call these proposals socialist. Without reference to control of the economy, the best we could call it would be very progressive and left social democracy, but it is the most thorough and radical set of left wing economic proposals currently out there. Does this mean voters will be faced with a real choice on economic issues in 2007? So am I jumping for joy? With regret, I am not. I am held to the ground by the firm grip of Mr Eamon McCann on my belt. Because as I was reading Sinn Féin’s pre budget submission, I was reminded of another article, by another journalist, about another Sinn Féin document. The article in question was a scathing attack by Eamon McCann, who lest it be forgotten as the entire establishment media seems to have, is a politician, a former election candidate and a member of the SWP, in the Belfast Telegraph in September on Sinn Féin’s submission to Sub-Group of the Hain Assembly’s Preparation for Government Committee. Wake up down the back. Now reading Eamon McCann on Sinn Féin and believing him is akin to reading Willie McCrea on the Pope and believing him, so I took a gander at the actual submission, which is contained around 150 pages into the 250 page long fourth volume of the report in question. I do not claim to have read the entire report. I do not believe anyone has ever, or is likely to ever, read it all. I read the various party submissions and shook my head in vague horror at the notion of the authors ever running anything bigger than a town council. So, which Sinn Féin are we talking about? The one in the South that proposes radical economic and taxation reform, or the one in the North that whines for a peace dividend? It’s an interesting question and one that, once Sinn Féin has sorted itself out on policing, is going to come more and more to the fore. From what I understand, the bulk of policy development on social and economic issues in Sinn Féin is anchored in Dublin with a negligible input from Belfast. In a way, this makes a certain amount of sense as being part of a functioning parliament here in the South obliges Sinn Féin to put more meat on the bones than they are forced to in the North. A couple of things are clear from all this. 1. Sinn Féin is, in all likelihood, going to be presenting the most coherent left wing economic and taxation package in the upcoming elections in the South. 2. Sinn Féin in the North is, on economic issues at least, at a very different stage of evolution to Sinn Féin in the North. 3. Sinn Féin, on the whole, continues to be a party dominated by a Northern based leadership disconnected from social and economic policymaking. 4. Numbers 1-3 point to an interesting clash on economic issues within the party in times to come, especially if it happens to be in government in the North, and not in the South. Posted by WorldbyStorm in Ireland, Irish Politics, Libertarianism, Media and Journalism, Social Policy, The Left. The Nally case depresses me. For many reasons. For those unaware of the broad outlines let me recap. In October 2004 Padraig Nally, a farmer in Mayo, came upon a man at the back of his farmhouse. In any event, he shot the tresspasser in the side, one John Ward – a member of the Travelling community, who then attacked him. Nally then beat him with a stick and then went away to get more cartridges from a shed for his gun before shooting Ward in the back as he retreated. He took the body and dumped it over a wall. Ward was no innocent with more than 80 convictions and four bench warrants for his arrest out the day of his killing (although these weren’t actually executed since he was being treated in a psychiatric hospital at the time). Nally was, according to those who knew him, a man living in perpetual fear of being robbed or attacked on his land. In the Central Criminal Court the jury acquitted Nally of manslaughter after three days of consideration. In a way I don’t really want to discuss the case, other than to echo the thoughts of the Irish Times editorial on the matter where it notes that “physical force must remain intolerable in all but exceptional circumstances”. However I do want to consider the overall environment within which we see this and similar judgements. And let’s contextualise it a little with a personal anecdote. In 1995 I was living off Ardee Stree in the Coombe in a rented house. The area was, like almost all urban areas, reknowned for the number of burglaries, and talking to neighbours and those in local shops the impression was that it was ‘a matter of time’ before my house was hit. And so it proved to be. I was woken one night around two o clock to the smell of cigarette smoke wafting up from downstairs. Unusual, since I’d recently given up smoking in the house. A moment’s thought and the sound of voices downstairs made me realise that there were intruders in the place. Now it was a smallish house, two bedrooms upstairs, a small hall with a tiny front room off it leading into a larger sitting room/dining room area with a narrow kitchenette leading off it. A back yard beyond was surrounded by high wall with that most inviting of decorative features, razor wire (installed by a previous landlord). I was fairly sure whoever had come in had made it through the front door, so in a way it became a simple issue of trying to get these people out. I got up, turned on the stereo upstairs, made some noise, walked around, waited ten minutes (no Nally me, but then no single barrel shotgun either) before gingerly going downstairs to suss out the situation. No sign of the intruders, but a puddle on the floor of the kitchenette (a rainy night, nothing more), a couple of bags taken, a shelf of CDs too and the stereo and TV on the floor where they had clearly being trying to untangle the entangled electric cables before making off with them. The door had been opened, in the absence of the Yale lock being set (I’d been away in the Aran Islands the previous weekend and was still in recover – so to speak), by a small triangle of clear plastic which they’d enterprisingly used to mess around with the other lock. The physical losses? Perhaps forty or fifty punts, some CDs (some of which I’ve yet to recover – anyone with Disco Inferno’s 1994 EP ‘The Last Dance’ email me – cheers) and that was about it. Postscript one: the next day, after calling the Gardai, who arrived and were suitably sympathetic and suitably realistic about catching these guys, I was out on the street outside the house when two guys in their early 20s passed by. One said, ‘Got 50 pence? Ah, no you don’t cos everything was cleared out last night’. Bizarrely one was carrying a copy of Salman Rushdie’s The Moor’s Last Sigh. So clearly a busy night for them. Postscript two: A week later my housemate was in the kitchen rummaging through the cutlery, and asked ‘Where’s the carving knife?’. It was gone, as with the puddle. Obviously their first port of call was to procure a weapon in case I came down suddenly. Postscript three: It took, and I kid you not, years to sleep well again in that house. Fitful sleep, bad dreams or nightmares – call them what you will, sudden waking, anxious reaction to small sounds. Even today I still go through phases where the after effects of that night recur. Not often, but too often for comfort – hence I have more than some sympathy for Padraig Nally’s state of mind. So I fully understand what it is like to have ones living space violated, to see that violation carried out with a significant level of threat and to then have to accept that this threat is constant. However, what’s the solution? Lock the door properly was obviously the first and most important one (although a later resident awoke to find people trying to get in across a sloping roof to the upstairs back bedroom some years later – the razor wire providing an insufficient level of deterrant). Had I my own weapon would that have made me significantly safer? I tend to doubt it. I was at a disadvantage one way or another as I came downstairs, if they were still there, with any sort of a weapon, they were in a position to see me before I could see them. But above and beyond that what level of force would I exercise in defence of my property? Well, taking the Nally route, shooting someone – twice? Perhaps, dependent upon the level of threat. I’d certainly have had no qualms in the context of someone attacking me outright. But there is a broader point. I live in the inner city beside a location where there has been unending physical and noise disruption for the past six years. Due to this local residents – myself included in one instance – have on occasion been the beneficiaries of compensation payments from various commercial and semi-state organisations. I don’t begrudge anyone that compensation, nor do I think it entirely unwarranted. Yet, I can’t help thinking that in the context of living in the largest urban centre on this island some level of discomfort is both inevitable and to be expected and that in certain instances the compensation has been wildly disproportionate to the distress caused. According to the media the perception of crime is on an upward curve, indeed Pat Leahy, Political Correspondant of the Sunday Business Post, has an excellent article on just this matter, and concludes that the evidence is that in the context of considerable population growth crime is in actual fact dipping slightly, that the funding for the Gardai has been effectively doubled over four years and that we have significantly increased numbers of Gardai. So why this misperception? Why did Nally live in fear of his life? Could it be that we live in a society which finds it far easier to enjoy vicariously the idea that this state is but one step away from the anarchy of the American frontier, than the rather sedate (in European terms) levels that we endure? In 1995 there were 43 homicides, in 2005 58 homicides during a period where the population increased by half a million. The concentration of murders has been in part due to an upswing in gangland violence, in 1996 8 incidents, in 2006 24 so far this year. This clearly is a significant issue, and one which greater resources should be targeted towards. However, in overall terms crime has remained relatively constant in the ten years with 102,000 approx recorded in 1995 and 101,000 approx recorded in 2005. This during a period where recording of crimes has improved. There are of course caveats, unrecorded crime is like an iceberg, it is literally unknowable, and it seems counter-intuitive that recorded crime should drop during a population increase. Yet, it’s important to note that this has also accompanied a time of rapid economic expansion and prosperity, which is widely recognised as having a positive impact on crime figures. So what am I saying? Nothing hugely original, although as I say it was refreshing that the Sunday Business Post was so honest about the situation. Without being cold about it, crime is a feature of contemporary society. It’s difficult to impossible to envisage that this will alter radically in the near future. There is a utopian strain in human thinking which sometimes seems to believe that all pain can be eradicated from life. I don’t believe that for a moment whether those who propose this are of left or right. And perhaps the price that is paid for living in complex societies, is one where instances like that which happened to me – and has left some degree of a lasting impression – are simply inevitable. That’s not to argue for complacency either. A media which, as the media does, relies upon exaggerating fear of crime out of all proportion to reality – and not just crime, we see the same pattern in almost every aspect of life, from health, education, food and so on – serves us poorly. These are real and terrible crimes that are committed, and resources targeted against specific areas are necessary (albeit in the context that significant resources have already been given to the Gardai). But there is another factor as well. Perhaps it’s my ideological approach, but I find the hypocrisy of some of those engaged in discussing these issues often risible. Having worked in areas related closely to the media the reality is that that and other areas of this society are awash with drugs. While ideally I would take a libertarian approach to drug usage, the prevailing reality is that those using them are locked directly into a process which ends at the death of an innocent plumber as ‘collateral’ damage in a gang war. And therefore, for what it’s worth, I think drug usage in this society in this point in time to be reprehensible. Unfortunately what I think is irrelevant, and consumption is unlikely to decrease. And this is where these supposedly disparate issues link. The shooting in Mayo is difficult to entirely understand outside the context of a society where physical danger to individuals in relation to crime is exaggerated. Gangland murders are difficult to understand except in the context of a society where illegal drug consumption is considered tolerable by significant elite or semi-elite sectors within that society. So yet again we have another area of contemporary life where profit from human misery in all these areas takes precedence and a Pharisaic approach on the part of the media, the general public and others remains the standard. Posted by WorldbyStorm in Israel, Middle East. The Jerusalem Post uses the second configuration, so perhaps it’s fair enough to accept it as is. Either way, it seems a clumsy and off hand phrase – exactly how it would be if it had slipped out in an interview. But hold on, this is the Prime Minister of Israel. Of all people on the planet he’s the last to allow strategic Israeli national security information to slip out in an interview – isn’t he? Naturally the Israeli opposition are blowing up a storm accusing Olmert of erasing a corner stone of Israeli national security. To be honest it’s hard to feel too exercised about it one way or another. My assumption, and I’m presuming it’s the assumption of regional governments, is that Israel has got such weapons, and has had them for some time (1968 to be precise if we are to believe CIA analyses), 200 weapons, if truth be told, which is an enormous cache. If there is a regional arms race it’s been a long time coming, and it hasn’t exactly been rapid. And realistically (and how I hate that term), there’s little that can be done about this. Still, putting national security aside there is one very practical reason why Israeli’s might feel less than delighted at Olmert’s (non) frankness. As the Guardian notes Israel evades “a US ban on funding countries that proliferate weapons of mass destruction. It can thus enjoy more than $2bn (£1.02bn) a year in military and other aid from Washington”. Incidentally, one of the particularly silly ideas of the further left is that there is a monolithic front of the US, the UK and Israel. This is a perfect example of how that isn’t true, that state sovereignty (or let’s use the old fashioned term nationalism) still trumps capital at the end of the day. The Israeli nuclear weapons program appears to be very much a home-grown operation, and clearly plays a similar role in the Israeli psyche as it does in that of Pakistan – one which engenders nationalistic pride, with of course the added bonus of security. Or more importantly it provides an even firmer guarantee of Israeli security than US support, and perhaps even provides Israel with a negotiating tool with the US, again in exactly the same way that Pakistan has now leverage due to it’s weapons with the White House (indeed is it too fanciful to see these weapons being used as a means of vetoing US intentions in the area where they conflict with Israeli national interests?). And on that topic for a moment or two… the Guardian also reported on how the Saudi’s have threatened to arm Sunni groups in Iraq unless the US stays in place. And why wouldn’t they? The catastrophe on their northern border promises nothing but pain for them, even if their own brand of Wahhabi extremism is in part responsible for some of the more appalling aspects of the violence. Still it places Bush in a remarkable quandry. World opinion, and that of his own bien-pensants, is at one in the belief that a US withdrawal is necessary. Yet regional actors take the opposite line. I may be wrong, but I’d predict that Iran also could be none-too-pleased at an early US withdrawal (and incidentally this mirrors to some degree the thinking of Irish Eagle on this topic where he argues that the growing regional aspect of the problem works to US interests since it inevitably concentrates the mind of these regional players – okay, granted, that’s a counsel of despair…). And can I recommend Timothy Garton-Ash and his latest piece in the Guardian on Iraq which essentially excoriates Bush. It’s also worth noting that despite his centre left/liberal position he was consistently opposed to the war from the beginning. Still, to return to the central point, perhaps Mordechai Vanunu, who might reflect wryly and reasonably on the fact that Olmert does not appear to be heading towads 18 years of incarceration for his statements, has the most level headed approach to this, actually welcoming Olmert’s partial admission when he says: “Obviously, I don’t welcome the atomic bomb but this openness could lead at last to some realpolitik – and maybe to some real peace”. Posted by WorldbyStorm in Art, Chile, Culture, US Politics. A remarkable photograph of Pinochet in the Guardian last Monday. It’s from nine days after the coup and he’s surrounded by his military staff. Perhaps it’s me, but there’s something about almost Renaissance like about this photograph (unfortunately I don’t have an attribution for it), a hint of Caravaggio (look at The Calling of St. Matthew) or a bit more than a hint, in the gestures, the poses, the sense of raw power that emanates from it. 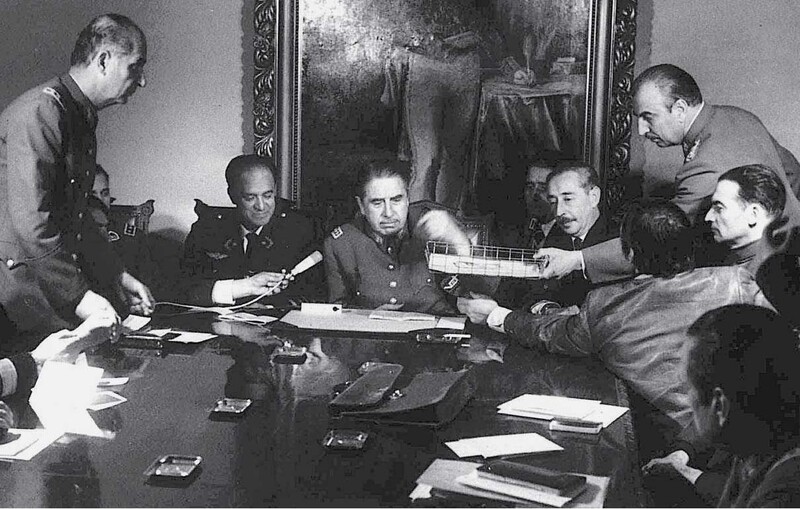 To the right of Pinochet appears to be Navy Admiral José Toribio Merino, to his immediate left Air Force General Gustavo Leigh (there is no detailed caption with the image, these identifications are made from other photos online). These were two of the original members of the ruling junta (the third I think is hidden behind the figures to the left – he was the head of the Police). Leigh was initially seen as the most hard line, and was the one who gave the order personally to bomb the Presidential Palace with Allende inside it. Later in 1978, and perhaps ironically, he was the first junta member to call for the restoration of democracy, which saw him removed from both the Air Force and the junta. Merino was more successful in holding onto power, retaining his influence with Pinochet and later presiding over the Joint Legislative Commission which ultimately saw the transfer back to civilian power in 1990. Then there’s the flunkies, almost entirely blank faced as they stand on either side of the table. It’s as if only Leigh, Merino and Pinochet are accorded the power to express emotion, which is perhaps why Leigh wears a slightly amused expression and Merino a tad bemused. While we’re looking at them, is that a priest sitting in side profile to us on the right of the image? And it’s Pinochet who the eye returns to again and again, he’s the man in command here, that hand literally a blur of activity, the focal point of authority, with even his nominal equals in the junta leaning very slightly towards him. Okay, so I’m retrofitting history in a way, or maybe not, but that implacable dogged face seems to tell everything one needs to know about how a man who had not weeks before expressed his personal loyalty to Allende could come to betray both him and Chilean democracy with seemingly no great thought at all. A number of years ago I opened a Christmas present from a very good friend to discover she had bought me a copy of Anthony Beevor’s outstanding book, Stalingrad. She was overjoyed at my visible delight and blurted out that I was a nightmare to buy for. Now from a clothing point of view, this is undoubtedly true, not because I am picky, but because I will wear pretty much anything. But for those of us who through a lifetime’s involvement in politics have managed to keep a couple of non-political friends, it can be difficult to realise just how tricky it can be for them to pick presents in areas we are interested in when they assume we have all the books and films anyway. A comrade confessed to me some time ago that his little sister, knowing my friend was interested in the second world war, had walked into Hodges-Figgis and bluntly asked whether the store stocked any books on World War Two. Admittedly, she was 14, but still and all…..
Consequently, I thought I’d suggest a couple of books and DVDs for the politico in your life over Christmas. Either ones I have greatly enjoyed, or ones I suspect most people with an interest in history and politics would find something in. Let’s get the obvious out of the way. You will buy/receive a copy of The Wind That Shakes the Barley at some point over Christmas. Loach’s film is an outstanding work and the always watchable Cillian Murphy, who first impressed me in 28 Days Later turns in a fantastic performance. For a Celtic Tiger generation poorly served by the Irish education system, it is a very valuable work. From an historical perspective, it does overstate the socialist element in the thinking of IRA Volunteers, but I choose to interpret this as compensation for the writing out of the role of the trade union movement and socialists in the War of Independence for the previous eight decades. Very enjoyable, moving and dare I say, inspiring. My next two DVD choices are a little less likely to have been noticed. I first saw Joyeux Noel in the IFI around this time last year and it is a perfect Christmas present. Shot in French, English and German, it tells the story of the 1914 Christmas truce on the Western Front during World War One. Diane Kruger, previously see in Troy, is the only face that might be instantly recognisable, but a fine multi-national cast provide supporting roles, including a number of British actors whose names escape me at this time. The film is a genuinely moving experience, a tribute to the ability of young men, in extraordinary circumstances, to display simple humanity to each other and to realise that they have more in common with each other, than they do with the men sending them to their deaths. It is also not without it’s own sense of humour and the music, the bringing together of the opposing sides starting, as it did historically, with the singing of carols, is beautiful, even if at times it is a little too clear the actors are not the singers. Highly recommended. One of the surprises for me of the year was Al Gore’s film, An Inconvenient Truth, both because of the poor opinion I had of Gore, and still do on many issues, and because environmental activism was never a huge interest of mine. It is refreshing to see a politician who clearly has a deep commitment to the work he is trying to do. The film makes a possibly unanswerable case against climate change and presents a challenging number of solutions. While the occasional diversions into Gore’s personal history are a bit disruptive in my opinion, it hangs together very well and for environmental agnostics like me, brings home the importance of what Trevor Sargent of the Greens often refers to as the single most vital issue facing us today, before ending on an optimistic note, pointing out that we are capable of preventing, even reversing, the environmental catastrophes we face, if we have the will to do so. For those who prefer a book to a film, a couple of outstanding publications this year. For me, first and foremost, Anthony Beevor’s new edition of the Battle for Spain. Even-handed, thorough and insightful, if you read one book about the Spanish Civil War, this is it. Beevor manages to maintain as objective a point of view as possible, outlining the atrocities committed by both sides, and arguing that if the right had won the election in 1936, the left would have risen up. But he reserves his greatest condemnation for the moral cowardice of the British and French governments who sat idly by, abandoning a fellow democractic government, and encouraging Hitler and Mussolini to think they could get away with a lot more. Beevor is a personal favourite of mine and this book, updated from the 1982 edition with the contents of Soviet archives, is one of his best works and was acclaimed in Spain when published earlier this year. John Pilger is a lefty staple and his latest book, Freedom Next Time, a collection of articles and essays, is well worth passing over the few bob. He describes the book himself as being one ‘about empire’, and his criticisms of the Israeli occupation of Palestine and the US invasion of Afghanistan are vintage Pilger, scathing, factual, honest and important. But for me, it was his passage on South Africa, outlining the economic failures of the ANC government that proved the most thought provoking. The ANC has, internationally, been able to bask for too long in its role as the opponent of apartheid, but as Pilger points out, the politics and skin colours might be changing, but the economic policies could have been written by Friedman. For the poor blacks of South Africa, it truly is, ‘freedom, next time’. For those with a particular interest in Irish politics, the outstanding book for me was How Ireland Cares by A Dale Tussing and Maev-Ann Wren. It should be required reading of every public figure who thinks to comment on the state of the health service in Ireland. As well as a first class analysis of the state of the Irish health service, demolishing the ‘black hole’ myth and tearing apart the pro-privatisation lobby with a bewildering array of statistics, international comparisons and economics, it goes on to propose short and long term proposals for dealing with the crisis in the Irish health service. It is not just a list of the problems in the Irish health service, it’s a list of solutions. The first one of these that I haven’t yet read or seen myself is Greg Palast’s latest book, Armed Madhouse…. Palast’s previous book, The Best Democracy Money Can Buy, was a great read, exposing the myths of the free marketeering globalisation gurus, the theft of the 2000 US Presidential election and more investigative reporting into corporate and business power structures than the rest of the establishment media in the US could begin to generate. Armed Madhouse is, I am told, more of the same. Written in a racy style, Palast has the humour and appreciation for lunacy that Michael Moore has, but coupled with a razor sharp mind and a fanatical devotion to the facts. It’s high up on my Christmas list. My final recommendations is a tribute as much as anything else. A Dirty War: A Russian Reporter in Chechnya and A Small Corner of Hell were written by award winning Russian journalist and human rights activist Anna Politovskaya, whom I first read in Pilger’s anthology of investigative reporting, Tell Me No Lies, where she was outstanding. Anna made her name reporting human rights abuses by Russian forces in Chechnya and challenging Putin’s increasingly dictatorial regime in Russia. She was, in a world where free speech is increasingly under threat from Muslim fanatics, from western governments who see civil liberties as ‘luxuries’ and from the excesses of political correctness, someone who was prepared to stand up, tell the truth and try to hold the powerful to account. She was murdered on the 7th of October, 2006. One of 1,100 journalists, cameramen, photographers, editors reporters and other media workers killed over the last twelve months. Posted by WorldbyStorm in Design, Education, Environment, Environmentalism, Ethics, Greens, NASA, Pseudo-Science, Science, Technology. 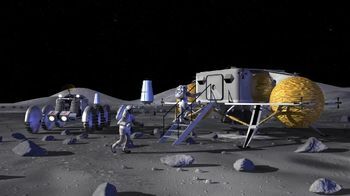 Okay, I’m slightly exaggerating about Missile Defence, but hear me out about Moon Base. In 1970 Victor Papanek, an Austrian designer and educator wrote a book called ‘Design for the Real World’. Originally published in Sweden, so popular was it that it was translated into English only a year later. The idea behind it was what Papanek felt was a mismatch between the power of design in contemporary societies and the lack of moral responsibility felt by the broad product design profession. As he noted himself ‘no a single volume on the responsibility of the designer, no book on design that considers the public in this way, has ever been published anywhere’. And from this Papanek developed a critique of this form of design and how it dovetailed with capitalism and sought to present a sort of roadmap for those involved in design. He argued that consumerist design was akin to medicine and ‘comparable to what would happen if all medical doctors were to forsake general practice and surgery and concentrate exclusively on dermatology, plastic surgery, and cosmetics’. Essentially he proposed that there are six areas where designers must positively engage. Firstly in the area of design for the Third World. Papanek considered that in a world where billions lacked the appropriate and sustainable technologies to improve their lives. He pointed to the lack of development in lighting or in upgrading or making more sustainable simple technologies such as paraffin or oil lamps. Secondly in the area training and educational devices for those who are disabled. His particular focus was on simple products which improve life, such as hearing aids. The costs of such items were extremely expensive, but through a more rational allocation of resources such costs could be cut. Yet this would demand a political and social will. Third he looked to design for medicine and health. Topical this, indirectly in an Irish context. He noted that at the time medical instruments were either over designed or extremely crude. He sought a more measured approach. Fourth he considered design for research was a necessity. Here we see an interesting, almost techno-utopian strand in his thinking. The idea is that much experimental equipment was over designed or badly designed thus inflating the costs of research. Again, he sought social and political change, but also accountability on the part of those who commissioned such products. Fifth, he saw the design of survival systems in hostile environments as a crucial priority. This included underwater, deserts, polar areas and space environments. With increasing pollution and a global environment under significant pressure he considered that it was necessary to ‘sustain human life under marginal conditions’. Sixth, he looked to design for ‘breakthrough concepts’. This is in some respects the most radical of his ideas. What he sought was rather than continual marginal improvement in products, instead a complete rethink about the purpose and function of items in order to make them more sustainable. So if you design a kettle you create one which allows for more precise control of the amount of water boiled in order to save electricity, and so on and so forth extended outwards to encompass all products. Needless to say this is a significant rupture with traditional consumerist design techniques, and one which hasn’t been un-influential. ‘Green’ and socially responsible design has begun to permeate product design in particular. And as for Moon Base, well look to the fifth area. That sort of cutting edge technological advance isn’t without benefits, particularly if this is positioned within an international context. More to the point, while direct applicability may not be absolutely forthcoming, aspects of it certainly are. I don’t want to overstate this. Project Orion, as the crew component of the new Lunar missions is named, is in many respects simply an extension of the old Apollo capsules, with capacity for up to 6 astronauts rather than the previous three. It’s not comfortable, it’s not a 2001 Earth Orbit to Lunar Surface style vehicle. But it is technology that has been proven to work previously and can be further refined. And this is also important in terms of our ability as a species to protect both ourselves and our planetary biosphere. One of the more disturbing aspects of our growing knowledge of how fragile that biosphere is has been the realisation that it is vulnerable both to anthropogenic threats such as climate change and external threats beyond the atmosphere. It’s something of a cliche to suggest that once humans travelled beyond Earth orbit and were able to show us the image of the planet from afar our relationship with the planet changed, but consider the manner in which for example An Inconvenient Truth was advertised. This sort of signification is of value. By the by, for those interested in this area a book by Nigel Whiteley, Design for Society, although dated, provides a good overview of the area.